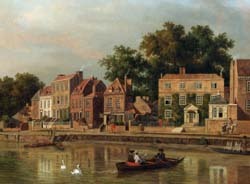 Samuel Scott, sometimes described as the English Canaletto, painted a number of views of Twickenham's riverside, some of them more than once: there are three versions of Alexander Pope's Villa as extended by Sir William Stanhope, dating from about 1758. Horace Walpole, the Earl of Radnor and Richard Owen Cambridge were numbered among his local patrons: he provided decorated panels for Cambridge's Venetian barge at Whitminster in Gloucestershire. Mrs Scott appears to have rented a cottage from about 1748, near Strawberry Hill. Evidence for this depends upon entries in the Poor Rate Books and a statement by Horace Walpole in a letter of 14 July that year: "...my brother Ned's eldest girl is come to Mrs Scott, the painter's wife at next door: the child is in a consumption, and so seeing her so ill lodged, I could not help offering her my house...". The daughter was Laura and Ned was his brother Edward, thought, from other evidence, to have developed an affection for the painter's wife. In 1755 Scott joined with Joseph Hickey in buying the Tanyard, attached to which was a cottage which may have been the one rented by Mrs Scott. They divided the land and each built a house on it. Scott did not occupy his new house, later known as Cross Deep Hall: he leased it, selling the property in 1765 to Frederick Atherton Hindley lately steward to the Earl of Radnor, and now living in Radnor House. 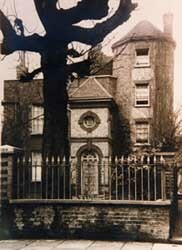 In about 1758 Scott himself took up residence in a part of the Manor House, opposite St Mary's Church in Twickenham, staying here for several years. 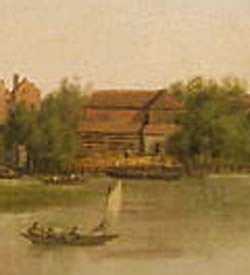 While here he made a watercolour view of the church which also shows the building of which the Twickenham Museum is a part: the earliest known view. This picture can be dated from the scaffolding surrounding the church for repairs "to the Great Cornish" known to have been undertaken in 1762. Scott finally left Twickenham in 1765, going to Ludlow where his daughter lived, before settling in Bath, where he died in 1772.